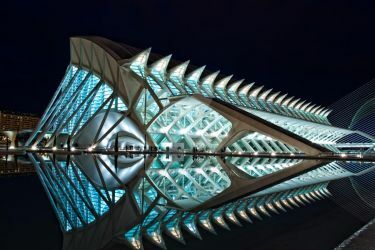 Night view of the "Museu de les Ciencies Princep Felipe" of Valencia (Spain), designed by Calatrava. Don't you think it seems the skeleton of a dinosaur? The complex now also appears in the remake of the Tv serie called "V ". In the mothership that visitors have parked on New York, you can find the City of Arts and Sciences in Valencia. Aloba has started a donation pool!